happy activism - Become a happy activist! At Love Not Waste, we are happy activists, spreading the word on how plastic waste can turn into brand new products. That's why we love to showcase these great sustainable brands. To inform you and to inspire you. Start wearing! Start using! Start smiling! Sweaters, tees and jeans. G-star Raw for the Oceans produces these awesome cloths from plastics recovered from the oceans together with yarn company Bionic since 2014 already. Both companies are supported and directed to success by music producer and artist Pharrel Williams. And this guy knows style like no-other! 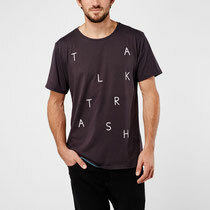 How come this shirt made of plastics still feels so soft? Read more about the technics. Start shining! 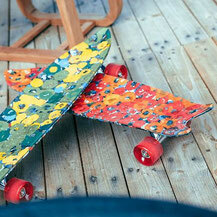 750 pieces of old bottle caps baked into a brand new mode of transport, this superfly skateboard. WasteBoards collects its raw material at dance festivals and canals of Amsterdam. They have created the world's first mobile skateboard bakery and aim to travel the world untill one day, there is no plastic waste left to collect and they can go happily out of business! Aren't I fly! This hi-tech sneaker is the latest Adidas prototype, born from a co-op with Parley for The Oceans, and was made from recovered fishing nets collected during a Sea Shepherd operation called Ice fish, a mission to protect sea life from illegal fishing in the South Pacific. 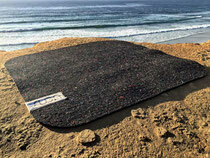 Can you believe that this comfy yoga mat of Suga was made from a pile of old wetsuits! Always knew that surf & yoga was a match made in heaven! Start ohmmmmmm! Surf champ Kelly Slater teamed up with designer John Moore and founded Outerknown, fashion solely made out of sustainable materials. 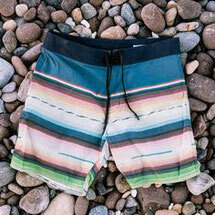 This surf short is made from ECONYL upcycled out of fish nets. Start peddling! 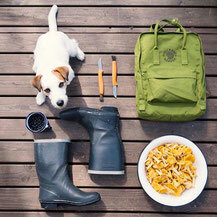 Outdoor fashion brand Patagonia produces clothes out of recycled bottles. They are also strong advocates on how to stop micro plastics from slipping into our environment including our food chain. Go outdoors! 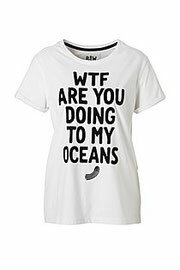 This new line of active wear would make founding father Jack O'Neill more than proud of his legacy! O'Neill Blue is the latest co-op with Bionic Yarn. Practical surf wear, intelligent design & fabric technics, make sure you are dressed more than comfortable in and out of the water! Start ripping! This chair was made by a 3D printer at FabLab Maastricht, The Netherlands. This workshop area is fitted with the latest machinery in 3D printing & laser cutting. Amateurs, artists, entrepreneurs, everyone is welcome to start creating your own products. And new FabLab's are opening up around the globe, there must be one close to your home! Start designing! California-based fashion brand Teeki developes active wear such as these beautiful yoga and surf leggings made out of recycled PET-bottles. It only takes 25 bottles to make this fashion statement! And you thought all activists dressed poorly, hah!? Not made out of recycled plastic, but Dopper makes sure single-use PET-bottles will extint from nature around the globe soon! The handy bottle-and-cup in one makes it more easy and fashionable to bring along your home-tapped water or drink on any surf trip or bike-ride. Buying one also means your are supporting one of Dopper's many water improvement projects. Ecover produces ecological household cleaning products for more than 30 years. They teamed up with Plastic Whale to collect plastic waste from the canals of Amsterdam. An Ecover boat was adopted and added to the fleet and a special edition packing was created from the recovered plastics. This summer Ecover & Plastic Whale join forces at several waterfront locations to collect even more plastics. Happy cleaning! Pack your bags! Well, pack THIS bag, it's made out of 11 old PET-bottles and just as strong and durable as the original! The bag was produced with a minimum CO2-footprint and the flashy colours are already added while spinning the yarn to lower the use of chemicals. Sorry, the bag doesn't come with the hairy compagnon. Happy trails!